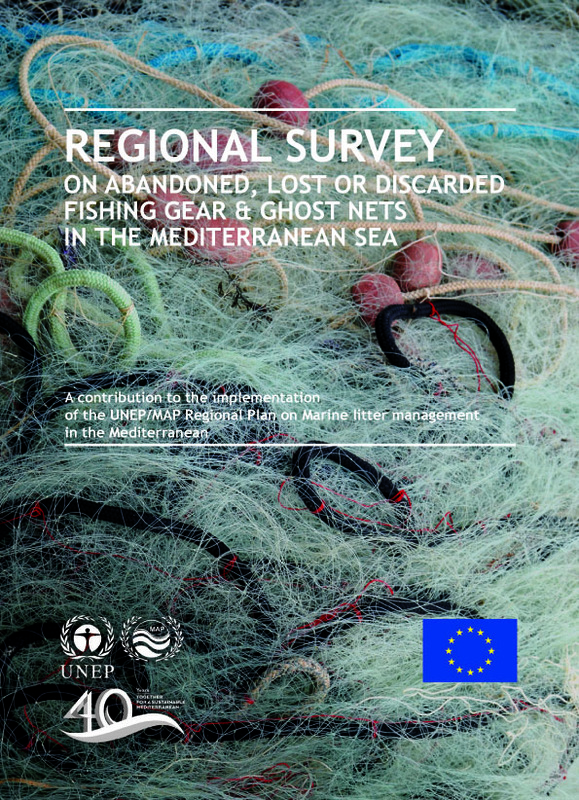 Regional survey on abandoned, lost or discarded fishing gear & ghost nets in the Mediterranean Sea, UNEP/MAP & MAP partner MIO-ECSDE, 2015. Within the framework of an agreement between UNEP/MAP and MAP Partner MIO-ECSDE, the latter undertook the task of conducting a survey-based regional assessment on abandoned, lost or discarded fishing gear (ALDFG) and ghost nets, relying on information collected mainly from fishermen in eleven Mediterranean countries: Albania, Algeria, Croatia, Egypt, Israel, Lebanon, Morocco (Atlantic and Mediterranean side), Palestine (Gaza), Syria, Tunisia and Turkey. The present report aims to provide insight on the issue of ALDFG in the Mediterranean sea, with regards to their occurrence, amounts, types and trends as these are perceived mainly by fishermen and/or other fisheries related stakeholder groups, such as crew members of vessels (ranging from small to big vessels, professional or pleasure craft, etc. ), port authorities, professional divers, etc. Furthermore, the present report aims to take stock of existing measures including regulations, cleanup operations, etc. to mitigate the impacts of ALDFG in the Mediterranean, as well as to assess the fishermen’ s intentions to engage themselves in ‘Fishing for Litter’ schemes, as the latter is one of the key measures to address sea-based sources of marine litter outlined in the Regional Plan for Marine Litter Management in the Mediterranean (Article 9, (6); Article 10, (e).